Hi, I am interested in your 1923 Ford Other Ford Models (stock #1724-TPA) listed on Autotrader for $23,995. I'd like to get more information about this vehicle and confirm its availability. 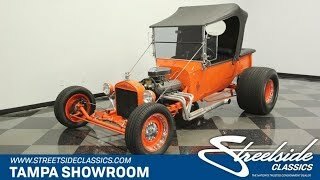 Dig deep into the details on this 1923 Ford T-Bucket, because the bold paint is part of a very well-coordinated total package. Plus, with big V8 power boldly leading the way, you know this street machine has the right mix of affordability and absolute cool. Orange Crush is the name of the paint yup, just like the soda. Youre going to need to know that, because everyone is going to be asking. After all, they didnt just paint the car that color, but also the grille, headlight surrounds, suspension pieces, and the chassis (so even the undercarriage looks fantastically bold.) The classic-style solid wheels are also orange, which looks especially nice on those ultra-wide rear ones. Plus, you have a blacked-out grille, black folding roof, and black vinyl cover over the bed thats carrying the battery and fuel cell. So this almost has a cool two-tone look about it. And as people get closer, theyre going to notice a ton of black and silver pinstriping that coordinate nicely with the accessory color and brightwork trim. So yes, this is one thoughtful build. While this T-bucket looks great with the roof in place, the full back interior with orange dash ensure the color coordination is a full package inside and outside. This has some nice thoughtful touches, like the color-matched seatbelts and how the pattern on the seat flows seamlessly through the door panels. Plus, you can tell it has been set up for driving with a Grant GT sports steering wheel, tall shifter, and a crisp full gauge panel including large speedo and tach. We like it when a Ford-style hot rod has blue oval power, so its nice to have this one on display for the world to see. The 302 cubic-inch V8 has the right performance pieces, including an Edelbrock four-barrel carburetor, Edelbrock intake, and headers feeding the growling side pipes. Plus, you have nice supporting components, like an electric fan and upgraded pulleys. The three-speed automatic transmission is a stout unit, and those massive Mickey Thompson rear tires makes sure the power meets the road. Add in the coilovers in the rear and disc brakes up front, and you have a great street machine package. This low-mileage build is out to be truly bold. So when something this cool is also so affordable, you know you need to hurry on this deal. Call today!! !